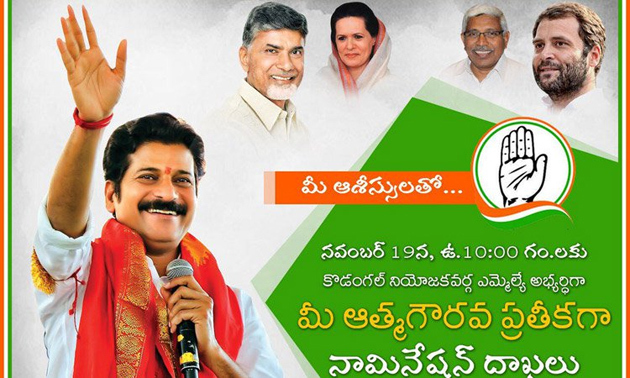 Revanth Reddy is all set to file his nomination in Kodangal Assembly Constituency on Monday (November 19th). The Nomination Poster unveiled by him became a hot topic in the political circles. Photos of Chandrababu Naidu, Sonia Gandhi, Kodandaram and Rahul Gandhi can be found on the poster. The Caption 'Kodangal MLA Abyardhiga Mee Athmagouravaniki Pratheekaga Nomination Dakalu' doesn't make any sense particularly after Revanth Reddy was caught red-handed in the cash-for-vote scandal. He actually brought disgrace to the people of Kondangal by indulging in such unethical practice. Will the voters in the constituency still see him as their pride or representative of self-respect? Analysts say, The graph of Revanth Reddy in Kodangal dropped drastically due to the cash-for-vote scandal. TRS kept getting stronger since then to pose a huge threat to the firebrand. Revanth Reddy is now solely relying on the vote bank of Congress, TDP, TJS and CPI to get elected as MLA.